Update December 2016: I added student comments from the Fall 2016 evaluations to the list. Plus, I decided to do a similar post to see what students say about creative work. Update May 2017. I added comments from the Spring 2017 evaluations. Update December 2017. I added comments from the Fall 2017 evaluations. Update May 2018. I added comments from the Spring 2018 evaluations. Update December 2018. I added comments from the Fall 2018 evaluations. 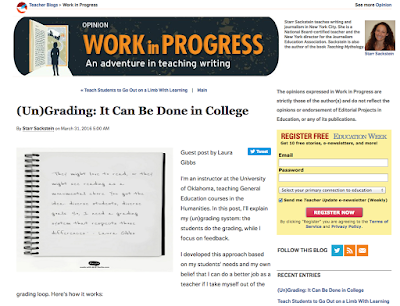 I have been thinking a lot about grading this weekend in order to write up a guest blog post (more about that here), and a friend suggested that I use student comments as part of that review: what a great idea! To search for comments, I went to the online evaluation system we use for classes at the end of the semester. The ratings (numbers) are made public through our Provost's website, but the really useful stuff — the students' actual comments — are not released publicly; only the instructors and university administrators can see them. So, what I did was to look through those comments, going back through the evaluations since Fall 2010 (that's when we went digital) to find comments specifically about grading in the classes. There's nothing fancy: I just did a simple Control-F search in my browser for "grad" (grade, grades, grading, etc.) to see what turned up. The results were really intriguing, and very encouraging too. Most importantly, there really weren't very many comments about grades compared to other things, which is part of my goal! On the other hand, you can see from some comments here that students are so used to the teacher "grading" things that they would sometimes refer to my feedback as grades — so when they said I was prompt in grading, they mean I was prompt in giving them feedback on their writing. That's not surprising: the word "grade" is all over the place in education, and we don't talk about "feedback" very much by comparison. My goal, of course, is to change that, so that we are focused on feedback instead of the grading! It was so nice to have certainty about what my grade would be. This course was ideal in that you get out of it what you put into it. If you work hard and put the effort in, you'll get the grade you want. I loved everything about this course; the online assignments, the completion grades, the ability to write blogs on our own and actually get better at writing, everything! Grades were entirely based on completion, so long as you put in the work you didn't have to stress about grades. We could move at our own pace, and forcus more on the stories and our writings more than our grade. I loved the grading method in this course. It was quick and completion-based, though I was always motivated to do my work at a high level, too. Laura is easy to communicate with, a fair grader, and provides her students with an interesting course. I loved her approach that we controlled our own grades and could finish the course early if we wanted. I highly recommend this course to anyone. It's a ton of work, but the most unique course you will ever have to take! I love how the course is formatted and the grading. I learned so much from this course. It was nice to be able to follow the class and miss assignments without trashing our grades. I came into it expecting to just be reading and learning about mythology, and was never expecting to be reading so many different types of stories and writing my own. The grading system encourages students to write for the sake of writing and not for the sake of a grade. This was the most unique course I have ever taken as far as how it was managed and graded. This unique format gave me the ability to learn and express my understanding in a way that didn't come along with anxiety about grades. This is the first time I have ever taken a course and was not stressed about grades so I purely learned the material. It was amazing and I think I learned more in this course than I have in any other in a long time. I loved that you could pace yourself throughout the whole semester and you had control over how you wanted to schedule assignments. There were many different kind of opportunities/assignments we could choose from so it was easy to choose something that we were interested it. Laura did a wonderful job at grading assignments and offering personalized grading. I like that we were in charge of our grades based on how much effort we put in. Laura is great! She has put a lot of work to make this online class fun for students and she is so prompt about grading items and giving awesome feedback to students over their writing! I had never taken an online course up until this point in my career, but this turned out to be one of my favorite classes I've ever had. You have the ability to learn as much as you would like to about the subject and the grading style was a welcome refreshment. The self-grading was definitely a nice feature. Also the ability to work at your own pace and the freedom to choose your own readings. This class afforded me freedoms that I was not granted in any other class. I felt like I was being treated like an adult for once. I liked not having to worry about my grade. I got to work as hard as I want to achieve my desired letter grade. She was very upfront about everything from the very beginning. SO SO organized. One of my favorite classes I've taken at OU. The content, structure, and grading of the course was terrific! Choosing the grade I wanted and being able to map out what I wanted to do to get there on my own schedule was really useful and lowered my stress significantly in this course. The way the class is set up and graded was very fair. I loved the class because of the felxibility and the way it is graded. The declarations were a really good idea. Even if I forgot to do it, I could email the professor to get the points. It was like self grading. This was the first class that had a grading method like this. I really liked the way this course was laid out. Grading yourself was very convenient, not having to wait weeks for grades was nice. If I could take it again, I would. I cannot express enough what a great class this ended up being. It gets an unfair rap for being easy, when in actuality, it's exactly as difficult as you make it. You can glide through and do the bare minimum and still probably get an A, or you can rise to your own standards and push yourself and earn the grade you get. We were able to choose what we wanted to read each week. The choices I had in the class was the best part. It made me feel as though I had control over my grade and my learning. I liked the near instant grade feedback that was provided by Professor Gibbs. I like how it was self graded. It was great! I enjoyed it so much! I loved being able to read and write for a grade! Everything is completion based, so the grading is fair. Even though the workload seemed like a lot, she made it possible to still achieve the grade you want by offering extra credit every week. I feel the strongest point of this class is the very self-paced, self-set tactics. You pick the readings. You set your schedule. You report your grades. The work is engaging and the professor is always available for assistance and support. Very fairly graded, professor did an excellent job making sure we improved our writing. I like that I was able to take control of my own grade. Grading system is the best I have seen. the grading was based on whether or not you did the work, so that was nice in the sense that we didn't have to worry about doing every little thing right. Laura was an effective instructor and gave more than enough opportunities to improve grade. The self grading bit was really strange. I really appreciated the way our assignments were graded. This class focused so much more on growth than grades, and that made the class feel like a much more positive environment than others I've taken before. When I fell behind in this class, I knew I could catch back up, because the focus was so much more on growing in my writing. Also, the course was graded fairly and always had a fair amount of work for the grade. I loved the grading system. I also enjoyed having the freedom to work ahead, self-grade and get the course done early, as well as the freedom to choose the readings and the direction of the stories. a good way to do an online course. very easy to do and get a good grade, but you do have to do the work and think about it. I liked the ability to work at my own pace and the structure of the syllabus. The assignments were consistent each week, and challenged us to explore the creative side of our brains. The grading was always fair. I just love everything about Dr. Gibbs format of this course - it really allowed me to use my own creative ideas, gather up points for my desired grade, and receive feedback from her and students in the class. Being graded based on completion rather than content encouraged me to be creative with my writing. I love that the course was graded on accumulated credit instead of percentage of credit; it encouraged exploratory learning that was perfect for the material. I love how Dr. Gibbs is so hands off and lets the students learn by discussing things with each other, while at the same time being there when we need her. She is absolutely wonderful at grading storybooks. When she likes something she lets you know. This is really encouraging, especially for people who don't have much confidence in their writing. I loved the positive feedback she gave me. Laura always grades extremely fairly. You could work at your own pace, and the grading was very fair. I really loved how interesting she made this class and how fairly she graded everything. You knew what to expect when going into the semester and that is what I like. If you worked hard you got a good grade and that is how I think classes should be. Also I liked how one bad grade did not screw you over like other classes. I love the concept of grade declarations rather than waiting for each assignment to be looked at and put in by the instructor, and the grading system in general was one of my favorite things about this course. Everything was very clearly outlined from the beginning and it was easy to see where I was at points-wise I at any time I chose. In many of my online classes I feel like I don't learn that much, but that was not the case whatsoever for this course. I also really enjoyed the grading system and the control we had over which assignments to do each week. I know that this is an online course and you have to do more work in order to get a good grade but the workload amount seemed a little excessive. This still did not affect how much I liked the course though. I learned a ton about topics I did not know. The grading was primarily completion which is great as long as you stay on top of things. Also, the assignments were fun and I learned a lot at the same time. The grading system used in this class was very effective for the type of work completed. Being able to work at your own pace was a godsend. It really helped to be able to anticipate busy weeks and get this course's work done ahead of time. My grades in my other classes were definitely better because of this. I liked the freedom to work ahead. Access to most of the coursework allows students hold students accountable for their own grade. I enjoyed diversity of the material and the quality of the content. I love that each week the student has the choice in which readings to complete. I liked the grading system being point based and up to the student. I really enjoyed how prompt the grades were posted and the ability to manage time personally and control your grade from the start. I am always worried about taking online courses because they are difficult to keep up with sometimes, but Ms. Gibbs does a fantastic job of not only being fair with grading, but providing feedback with all of the work that I did and helping me reach the grade that I wanted/deserved at the end of the semester. I learned a lot and felt that it was graded fairly. She designed the course in such a way that the students could work at their own pace and design their own grades. The motivation for this was high for me, encouraging me to want to learn more and do my best. Easy to finish class early and graded based on completion. I also liked not having tests. I like the way the class is graded. I find it really contributes to learning vs memorizing. I love her grading system and her teaching methods. I was learning things without even realizing it! I would say that the load is too high, but the grading is more than fair. I really liked how reasonable Laura was. The work wasn't hard or too heavy, but she always made a point to be understanding if it was time for midterms, etc. She said she understood if we couldn't get something done and gave us a link to see about how much we could not do to still get the desired grade. The grading system was really great; convenient, easy to figure out, and always felt like it reflected the work I'd done. The wide range of topics and enthusiasm of the instructor for the course material were the best parts; getting personalized feedback was really encouraging. I like how we had the opportunity to think for ourselves. Our writing could be about whatever we felt like and were read without judgement. I also like the improvement in my proof reading skills. I felt like I was pushed in this area and therefore I was able to grow. I thank Laura for helping keep this course interesting but also challenging our learning but giving us multiple opportunities to make the grade that we desire. It had a fabulous structure that included a good amount of work but allowed the student to complete the assignments and the course early. Through this course, I feel as though I was able to really improve my writing more so than I have in any of my honors college courses. Perhaps because this class was less pressure? I'm not sure, but I believe the structure and the grade upon completion with comments from peers allowed me to be more confident in my writing. I loved the way this course was graded. I thought this course was awesome because it gave us so much freedom to do the work whenever we wanted to. It was also good because as long as we did the readings and the writings we would get a good grade. This was new for me because usually everything in previous classes was graded hard. This took the pressure off worring about getting an A or B and actually learning the material. Laura is very organized. Her students always know what to expect in the course and can work for the grades they want. Despite the workload, it was very enjoyable. Also, since we had a lot of control over our grade, it felt much less stressful. I loved how you could work at your own pace. There were so many points and opportunities for you to get the desired grade. It was great to know that you had a goal and it motivated me to do the work for the class. It was enjoyable and creative. It was also easy to know where I stood in the class and how my grades would turn out. Laura was extremely organized. The course was organized in a manner that was conducive to students' schedule. You are able to pick your grade. You get the grade you work for. All students knew exactly how much work was required to obtain their desired letter grade. I loved the course. The material is intersting, there is plenty of chances to earn the grade that you want. It emphasized much more creativity than most courses that I have taken. It was a very nontraditional course but set up very well. Laura Gibbs did an excellent job of managing the course and grading fairly. Laura did a great job managing the class, was always prompt with grading and questions. The instructor had an extremely fast turn around time for graded assignments and was also very prompt answering questions. I also appreciate the feedback from the instructor. She paid individual attention and feedback on my assignments and I felt like she spent as much effort grading my assignments as I did writing them. I really enjoyed that she allowed for us to submit assignments on our own time and that we could stop working when we got the grade that we wanted. I love that it was a "work at your own pace" kind of class. I love classes where I don't have to really worry about my grade. Therefore I was glad to do the assignments, because I was actually interested in them. I always knew what grade I had and what I needed to complete in order to get the grade I wanted. 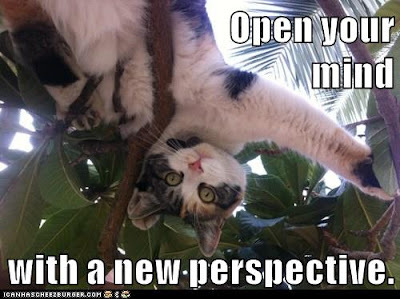 Open your mind with a new perspective.